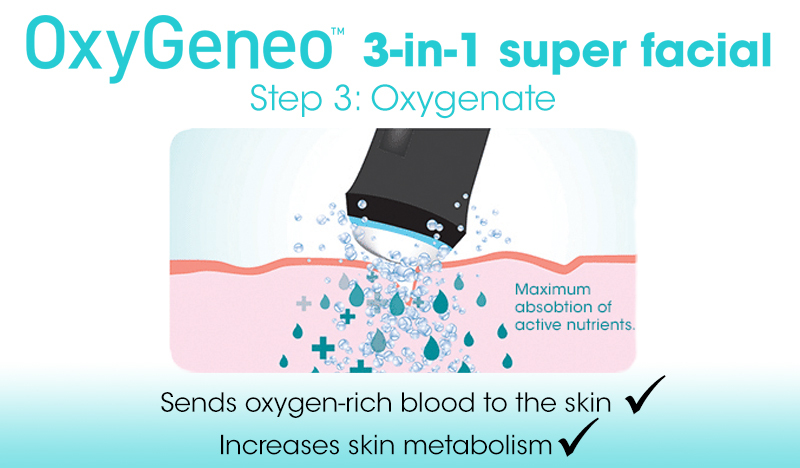 Experience the Super Facial incorporating patented OxyGeneo™ Technology for unparalleled skin nourishment and oxygenation. 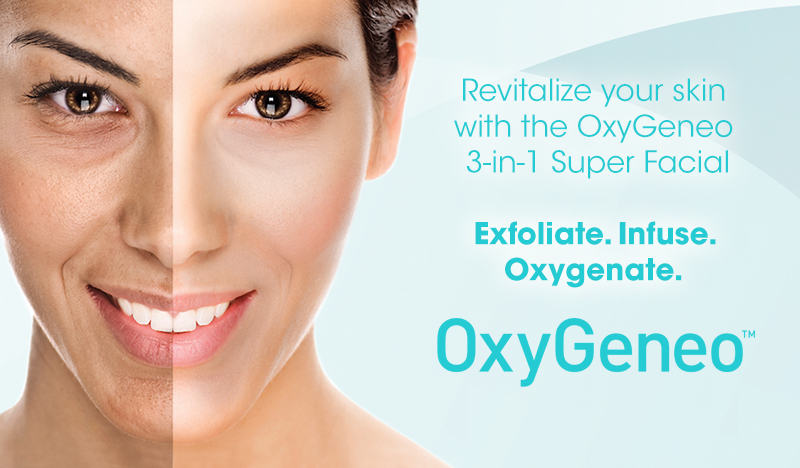 See healthy, hydrated, younger looking skin with OxyGeneo™. OxyGeneo™ Therapy gives better results; enjoy the benefits of exfoliation similar to microdermabrasion, but with no downtime, extractions to decongest blocked pores, plus deep facial rejuvenation with the infusion of essential revitalizing nutrients and healing skin oxygenation from within. OxyGeneo™ treatments are suitable for all skin types, including sensitive skin. 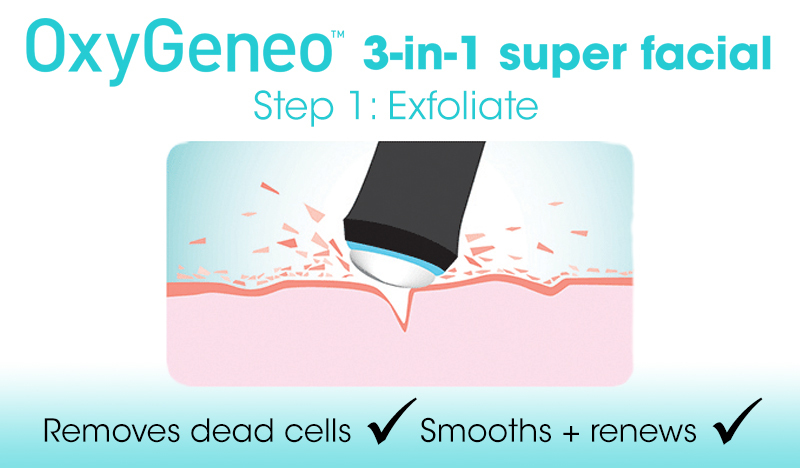 Breakthrough OxyGeneo™ technology provides superior anti-aging results by treating the skin at a deeper level. 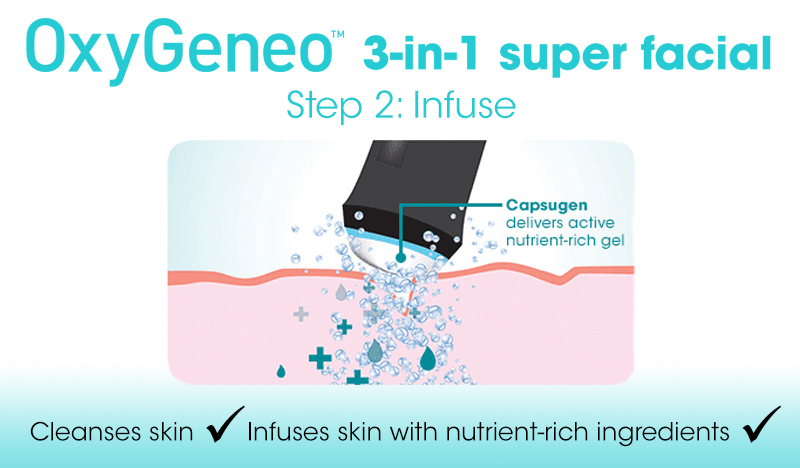 Exfoliate, Extract, Infuse, and Oxygenate your way to youthful skin. Similar to microdermabrasion, the OxyGeneo™ Super Facial exfoliates the upper skin layer to remove dead cells, smooth and renew the skin, preparing it to receive active nutrients. The OxyGeneo™ is safe on all skin types and we can treat sensitive skin without any irritation. We also provide extractions to clear and decongest blocked pores. Along with the NeoBright™ and NeoRevive™ treatments, we use ZO® Skin Health, SkinCeuticals, VivierSkin and SkinMedica products for complete rejuvenation, correction and protection. These have active ingredients such as alpha-hydroxy acids, anti-oxidants, peptides, growth factors, soothing and healing agents, brightening products and the ultimate in protection to restore the skin’s natural balance and radiance. Our Vive®professionals will give you helpful suggestions for therapeutic treatment products, customized to target your specific concerns, for your home skincare regimen to enhance and compliment your results. BOOK ONLINE or call 403-237-8428 8428 to learn more about our professional Medical Aesthetic Treatments in Calgary.